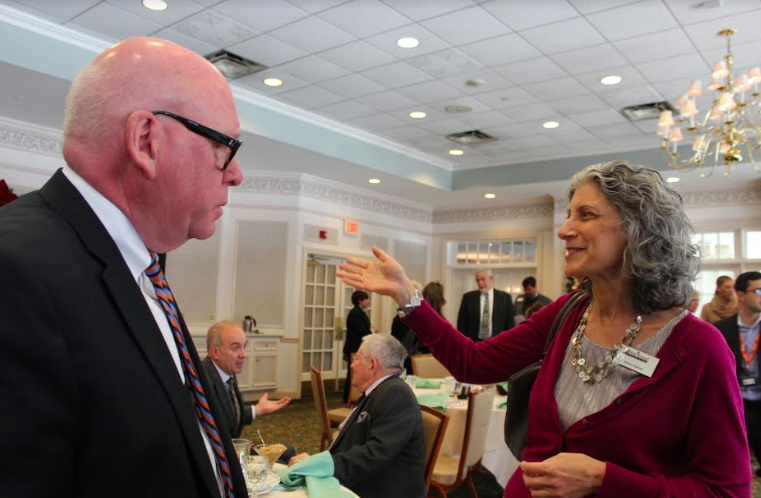 Kevin Dahill, president of the Suburban Hospital Alliance, talks with Alison Kellner of Home Instead Senior Care after the RBA’s luncheon at the Rockland Country Club on December 14. With four decades in the industry, Dahill says consolidations and mergers are becoming commonplace as hospitals and doctors try to meet needs of patients while keeping a handle on costs. New York is awaiting CHIP (Children’s Health Insurance Program) reauthorization, which covers nearly 10,000 children in the county. The cost of Medicare and Medicaid—estimated at $1.5 trillion dollars a year—are likely to face cuts with changes to the Affordable Care Act, said Dahill. He also spoke about the proposed merger with CVS/Aetna, which is seeking to put a nationwide network of community medical clinics in its stores. Similarly, NY Presbyterian announced a partnership with Walgreen’s (Duane Reade) to establish urgent telecare and digital ER kiosks in stores in Manhattan, where no insurance is accepted. It’s $99 a visit.